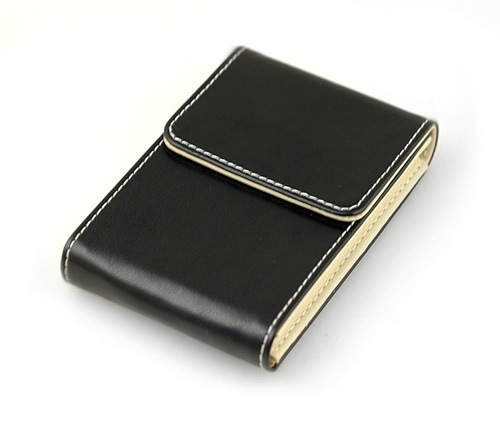 OUT OF STOCK: Sorry, we are currently sold out of the 'Black Flip Top Hinged Cover Business Card Case*'. If you have further questions, please call our customer loyalty team at 1-800-793-3924. 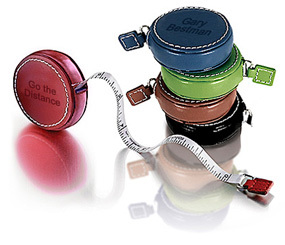 This executive business card case is one of the most stylish and impressive ways to carry about your promotional materials. The business card is sort of like a salesperson, representing the face of your company. If you keep them stored in a sweaty cluttered pocket or stuffed into the side of a wallet, you might not be showing the image that you want your company to project. This attractive casing allows you to evoke a sense of precision and care that will translate into trust in your customer's eyes. This case is crafted from rich black leatherette which is contrasted by a bright white cross stitch. The entire piece is simple, yet elegant, with a silver clasp plate adoring the front surface of the container. Small enough to fit in just about any pocket, this casing will protect your business cards from dents, scratches, and curled corners, while also showing that you take your business seriously. You also have the option to have this case personalized, with engraved writing available on the surface of the clasp plate. This can be used to carve your name, your initials, or even an inspirational word or phrase that may act like a call to action for one of your customers. Another option is to give this business card case away as a gift to an executive businessman or businesswoman in your life. This is a great gift for someone graduating from business school, law school, or even for someone who just got their first corporate position. Being able to have their name engraved on the casing will give you the ability to make it a gift which they will treasure instantly. This is a great product. I know that its suppose to be used for business cards but I use it for all of my credit cards. They fit perfectly along with my drivers license.